Add a touch of class and elegance to a dining room or kitchen thanks to the Domingo Extension Table. The base features strong, durable construction of brushed stainless steel that ensures it will continue to perform for years to come. 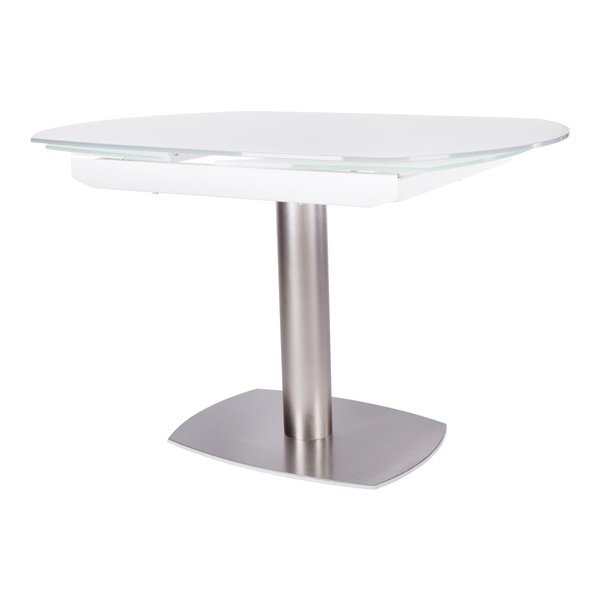 The table top features a matte white finish that sparkles and consists of extra clear tempered glass that will maintain its appearance. The column consists of brushed nickel steel that delivers tremendous support. Pick up a first-rate table that is both stylish and practical with the Domingo Extension Table. Consists of 10 mm extra clear tempered glass that is both strong and beautiful. Features a stunning matte white finish that is sure to impress day after day. Offers plenty of space, ensuring you can use the tabletop during dinner parties and casual and formal occasions. Column consists of brushed nickel steel. Brushed stainless steel finish will continue to impress for years to come. Offers a practical and stylish choice in a dining room or kitchen.